The UK pensions system is not working, the City watchdog has concluded following a review into the "disorderly" annuities market. An annuity is a retirement income that is bought once with a pension pot and provides an income for the rest of the holder's life. This income could increase by 6.8% a year by shopping around for an annuity, the Financial Conduct Authority said. And the industry had "closed the door" on those with small pension savings. People who save into a defined contribution pension will almost always buy an annuity with their pension pot. It is the most common form of retirement income, apart from the state pension. The Financial Conduct Authority (FCA) reviewed 25 pensions firms representing 98% of the UK annuities market. What type of policy and which options? Which annuity company pays the highest income? If you will be paying tax on income you don't need or you think annuity rates are about to rise, you might consider deferring your annuity in the hope you will be better off. However this is tricky and you could lose out if you get the sums wrong. Although most people purchase a traditional annuity there are a number of alternatives such as investment-linked and drawdown which can be considered by those who can take some risk. It is only natural to want the highest annuity income as soon as possible but an annuity lasts for life so it is important to consider all of your options are before making an irreversible decision. The FCA found that six out of 10 retirees bought an annuity from the provider which they used when saving for a pension. Many looked elsewhere but did not switch. But 80% of those could have got a better deal, and a more generous retirement income, by shopping around effectively and then buying the annuity from another provider. In pounds and pence, the typical pot of pension savings analysed in this review was £17,700. This would typically be used to buy an annuity that would pay an annual retirement income of £1,030. But by shopping around, that annual income could increase by £71, or 6.8%, to £1,101. 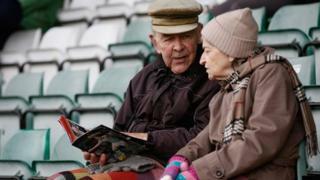 One in six people could see their retirement income increase by more than 10% if they changed provider, the FCA said. Those buying an enhanced annuity - available to smokers or those with a medical condition that shortens their life expectancy - could see a £135 a year, or 8.3%, rise in annual retirement income by shopping around, after building up an average pension pot of £26,800. "The need to get an income in retirement unites us all. But once you've bought an annuity you can't change your mind," said Martin Wheatley, chief executive of the FCA. "We need to understand why they aren't shopping around and switching." The FCA review found that people who had saved less than £5,000 into a pension pot were particularly poorly served by the industry. "There is virtually no market whatsoever for people with smaller pension pots. This means that for those people who need to make every penny of their pension count, the market has closed the door on them," Mr Wheatley said. "There should be competition across the entire market, not just for those with the most money." Media captionFCA chief executive Martin Wheatley: Information on annuities "too confusing"
The FCA will now conduct a study to assess competition in the market, and will publish some possible remedies within 12 months, but some have argued that the process is too slow. "It is disappointing that after a full year we still have to wait many months more for a second stage investigation by the FCA before regulatory action of some description can be initiated," said Malcolm McLean, consultant at Barnett Waddingham. "The purchase of an annuity is effectively still a one chance opportunity. Consumers must always consider that while a difference between annuities may not seem like very much, if they then multiply this by 20 to 30 years the losses in retirement income can add up to a significant amount of money." Andrew Tully, of provider MGM Advantage, said: "The FCA review doesn't go far enough, or act quickly enough. This will potentially leave many thousands of retirees high and dry when navigating the annuity minefield." Most complaints made to the Financial Ombudsman Service emerged from a lack of explanation in plain English from a provider about what an annuity is and how it works. The Association of British Insurers (ABI), which represents many pension providers, said that changes were already being made to make things clearer. "We recognise that our industry can do more to make the market work effectively for customers which is why we are finalising a new package of measures to enable people to engage and to shop around for better deals," said Otto Thoresen, director general of the ABI. "This would include ensuring customers have the right to a conversation to help them understand the difficult decisions at retirement; and how all customers can get a comparison of rates." Some 420,000 annuities are sold every year, and millions of workers are saving into a pension pot so will eventually need to buy an annuity. The amount that a pension pot could buy in the annuities market fell sharply during the financial crisis, but started to recover in 2013. The FCA found that nearly all price comparison websites it studied failed to offer clarity for those shopping around for a good deal. Pensions Minister Steve Webb said that the FCA's review of the market was vital as more and more people save into a pension through the automatic enrolment system. "This makes taking effective action to ensure that people get value for money from annuities all the more important, and the new FCA review is a welcome and crucial step, as part of the government's on-going work on the issue," he said. "We want to build a fairer society, and that means helping people to get the most out of their hard-earned pensions savings when they retire." Not everyone has to buy an annuity to receive a pension income. Those with final-salary pensions will be awarded a pension pot linked to their salary when they finish work, so will not need an annuity. The state pension is also unconnected to annuities.